A not-so-long time ago, in a galaxy pretty nearby, fans lined up to buy toys of Captain Phasma, Kylo Ren and other brand new characters from a movie they wouldn’t see for another three months. Only one franchise could harness that kind of blind power: Star Wars. And that’s because Star Wars and toys go together like Han Solo and the Millennium Falcon. 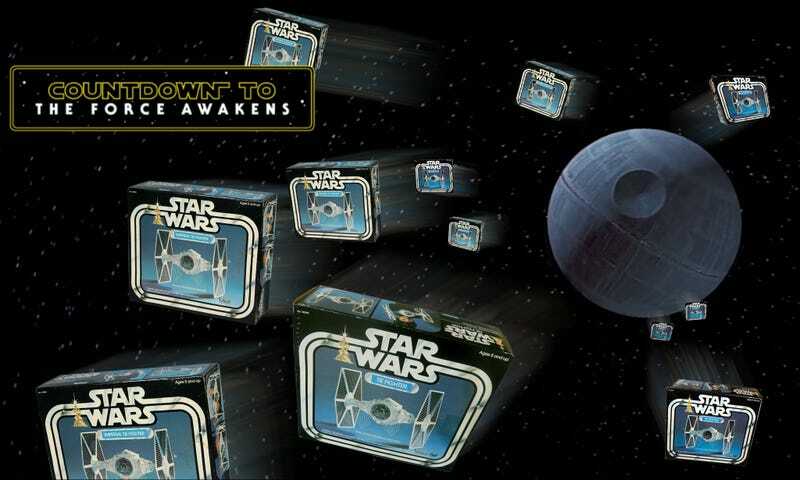 The Star Wars brand was built on its toys and merchandise. Younger fans may not remember the first time they saw The Empire Strikes Back, but they remember running around with an X-wing fighter in their hands. It was that nostalgia and passion which drove fans to line up in September to buy toys for the saga’s seventh and newest film, Star Wars: The Force Awakens. And that’s the multi-layered result of the franchise having literally changed the entire culture around movie merchandising, especially toys. Before Star Wars, toy companies waited to see if a movie was a hit before releasing a bunch of toys. The most popular licensed toys were based on TV shows and comic books. Mickey Mouse and his Disney friends had been cashing in since the 1930s. Comic strips like Popeye were popular and television shows like Star Trek and Superman, did well too. G.I. Joe was big, along with Barbie , and lots of the toys people still know and love today. But very few were from movies and even fewer, if any, were from movies currently in theaters. Which is easy to say now but in 1977, Star Wars was originally treated like almost every thing else. “There had never been a successfully licensed motion picture because in those days they waited to see how successful a movie was before even making the stuff,” said author Steve Sansweet, a former Lucasfilm employee and COO of Rancho Obi-Wan, a non-profit Star Wars museum housing the world’s largest Star Wars collection. In fact, several big companies—including Mattel and Mego, which had the DC and Marvel licenses—passed on Star Wars merchandise before Kenner got scooped it up. Which is why 20th Century Fox allowed George Lucas to make what is now considered either one of the smartest, or dumbest, deals in Hollywood history. Depending on whom you ask. Lucas agreed to take a smaller salary on the first Star Wars as long as he could retain full rights to any possible sequels and merchandise. Fox, not looking at the big picture, agreed. They probably regretted it minutes into May 25, 1977. That’s the day Star Wars hit theaters and demand for merchandise was almost instant. But there was almost nothing for people to buy. T-Shirts mainly. Kenner had officially signed the deal to make toys only a month before, but considering the time it takes to design, manufacture, package and distribute, they were many months away from releasing figures. There was insane demand and zero product. That was true down to even the smallest detail. A 3.75 inch detail. One of the most crucial decisions in the history of Star Wars was Kenner and Lucasfilm’s decision to buck the trend of the time and make the Star Wars action figures a smaller size than the majority of other figures of the era. “They could have gone 7 [inch], they could have gone 12, but the fact they held it to [3.75 inch meant that] they were able to produce the vehicles not only to fit on the shelves but at a price point people could afford. That was certainly key to everything” said Sansweet. Though Star Wars wasn’t the first 3.75 inch figure, its success basically made that size the standard going forward. G.I. Joe, for example, was originally a 12 inch figure. By the early Eighties, these figures were 3.75 inches tall instead. “The figures would be large enough to sculpt the personalities required – but were small enough to allow us to create the ‘kid-friendly’ vehicle world,” Brodeaux said. Basically 3.75 was the smallest size Kenner could make each figure so they looked different, could go into different ships, and be affordable enough to buy a bunch of them. It was the perfect compromise. By March of 1979, with development well underway on the second film, Star Wars toys had grossed over $200 million. And that’s when things changed even more significantly. To start, Kenner would first figure out what the “core elements and key story beats” were. Those would hit shelves first when the movie was released. From there, since there were several years between films, conversations would then turn to “what’s next?” What secondary and tertiary characters were cool, fan favorites and necessary to recreate some of your favorite scenes? Those would be released after. That kind of success does not go unnoticed and it set the tone for everything that followed. These days, licenses are in place well before a movie hits theaters. It’s a given that movie merchandise will be on shelves on opening weekend and that your favorite soda will be plastered with Marvel or DC characters. But that all happened because of Star Wars. In fact, the success of the Star Wars toys inspired other toy companies not only to produce smaller toys and vehicles, they created entertainment franchises based on toys too. G.I. Joe, He-Man and Transformers all started as toys and then became iconic pieces of television or film. Which is why, popular myth might have you believe some of the later Star Wars movies began to create characters and vehicles only because they could be turned into toys. The best example being the seemingly random introduction of the toy-friendly, teddy-bear looking Ewoks in Return of the Jedi. That’s from the creator himself—but, even so, some fans and experts have different takes. According to Sansweet, from 1978 through 1986—which is how long toys based on the original Star Wars trilogy were produced—Kenner sold a quarter of a billion action figures worldwide. Plus if Lucasfilm was focusing on making characters only for toys, they did a very poor job. In the eight years that toys were released for the original trilogy, they made figures of 115 different characters, according to Sansweet. In the years since, 1995 to today, they’ve done over 2400 different characters. Lots of that is because of the Expanded Universe, prequels and now The Force Awakens. There is more Star Wars to mine than that ever was before. But it’s also because the Internet changed everything. That story, of getting into the movies by way of the toys, has become common among not only Star Wars fans, but non-fans too. Everyone has owned, or played with, a Star Wars toy. Yet even when the toys seem to supersede the films, the people behind the scenes still hold true to Lucas’ original sentiment. The story rules. You can’t always be watching Star Wars movies. But you can always dive into those memories via the merchandise. And it’s a big part, maybe the biggest, of why Star Wars is still as popular as ever.